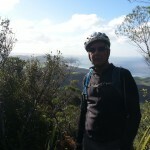 The rumour Kerry had heard about a section of ridable trail along the ridge at the top of Mt Lion at Whangarei Heads is not untrue; it has even been newly metaled. The only problem is that it is barely 40 metres long, and you have to carry your bike up about 800 steps to get there. The steep, somewhat slippery steps started again soon after the ridable bit ended, so we stubbornly carried the bikes up another couple of hundred of them before admitting to ourselves that we weren’t going to get to the other end of the trail before dark. 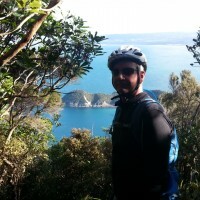 Since we were nearly at the summit, we left the bikes and walked the rest of the way, to be rewarded by spectacular views up and down the Northland coast. Getting the bikes back down proved to be a lot easier than I had feared, but it wasn’t the sort of downhill we had in mind. I can see why DOC hasn’t bothered to put no-biking signs at the start! We discovered that there is a bike track around the headland to Smugglers Bay, but we only had the energy to ride the northern section.